Summers are full of weddings. 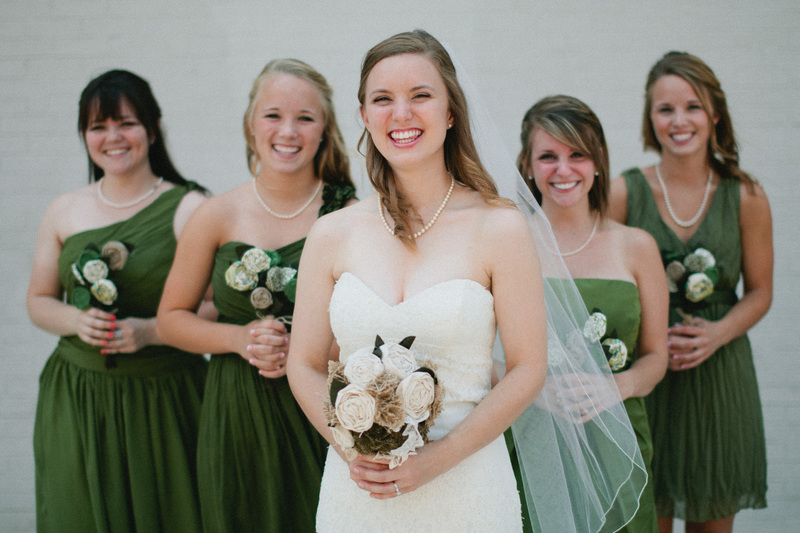 I’ve always loved weddings, but now that we’re married they carry such special significance. 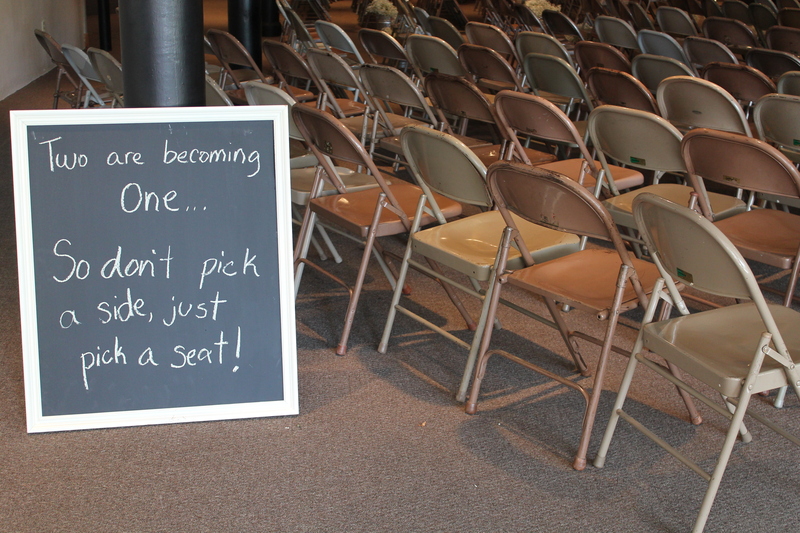 I love being able to be reminded of our commitment to each other and how marriage displays the gospel. And they always bring up such wonderful thoughts of our wedding. Our wedding day was just wonderful and perfect. Everyone’s really is though. Because they reflect the unique personalities of the couple and represent them. 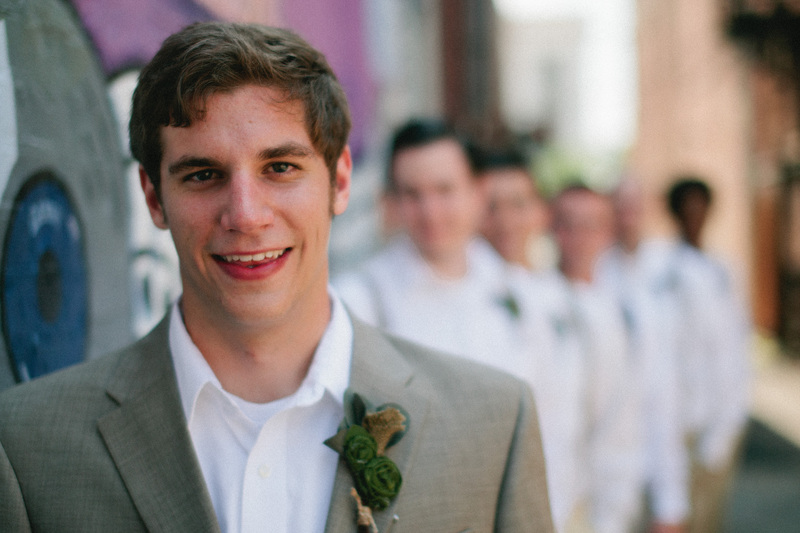 I love thinking about our wedding. Spencer and I planned it together. We worked hard to make it reflect us and had a blast in the process. 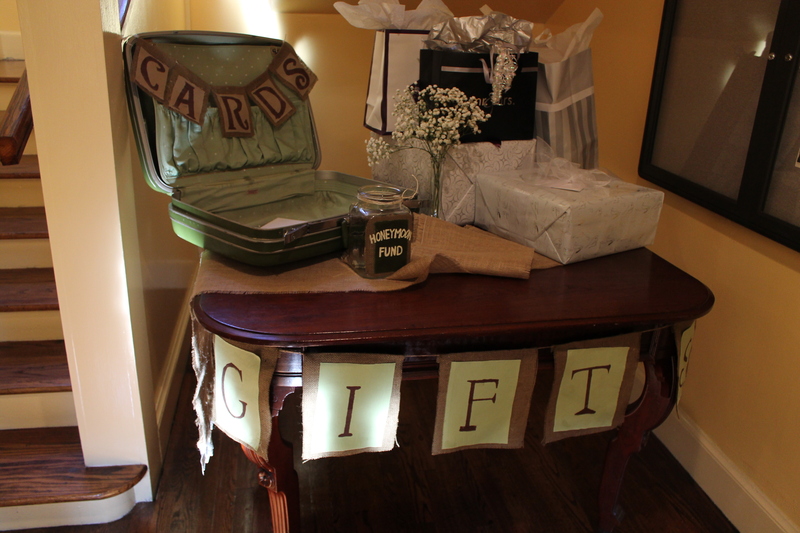 We came up with the decorations and tried to be as cost effective as possible. We loved how it all turned out. So I thought I’d share some of our crafts and ideas. We tried to keep things consistent. 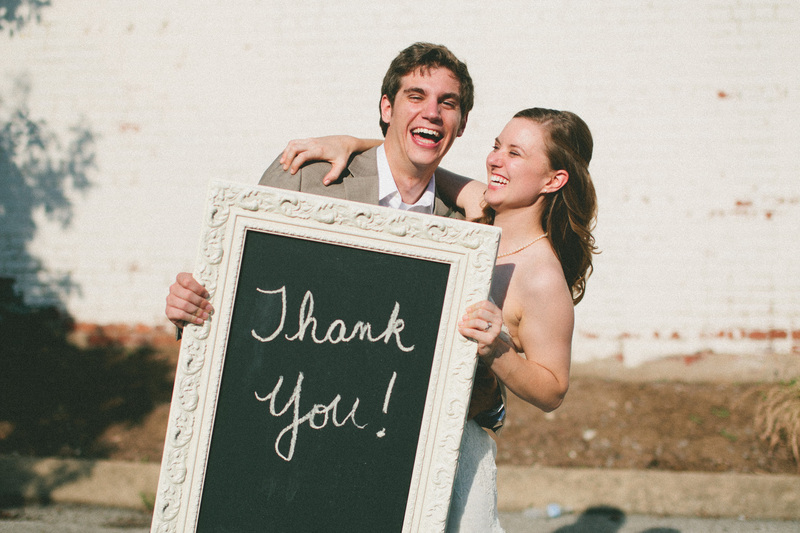 Using chalkboards was a great way to do that. 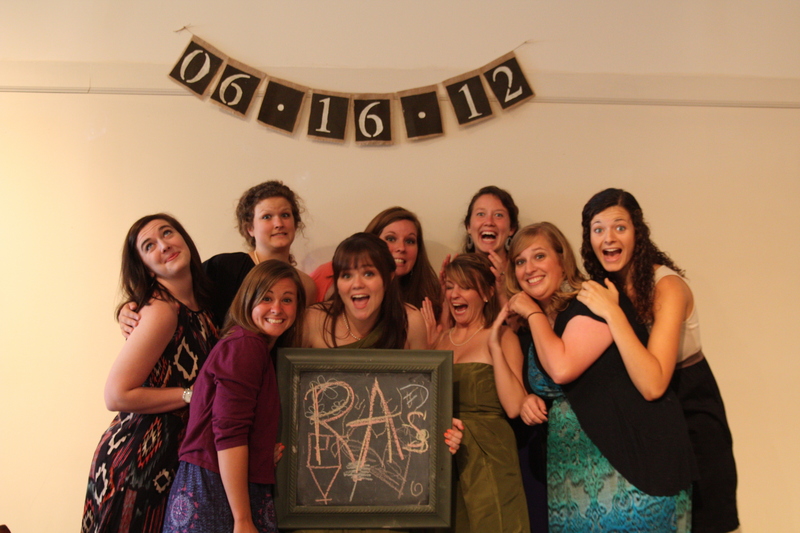 We made chalkboard from frames found at garage sales and thrift stores and chalkboard paint. 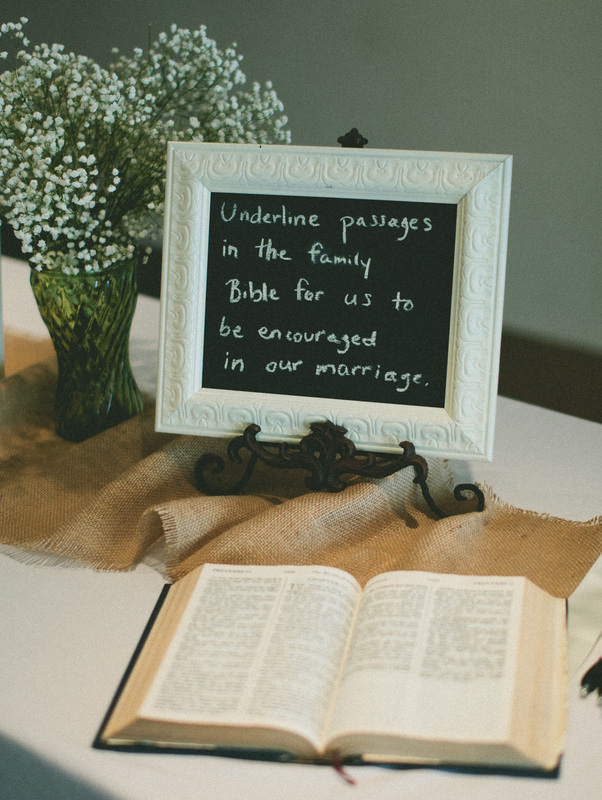 We used an old family Bible for people to underline passages for us to go back and read later. This is something we will treasure and be able to pass down. This box is something my grandfather made. 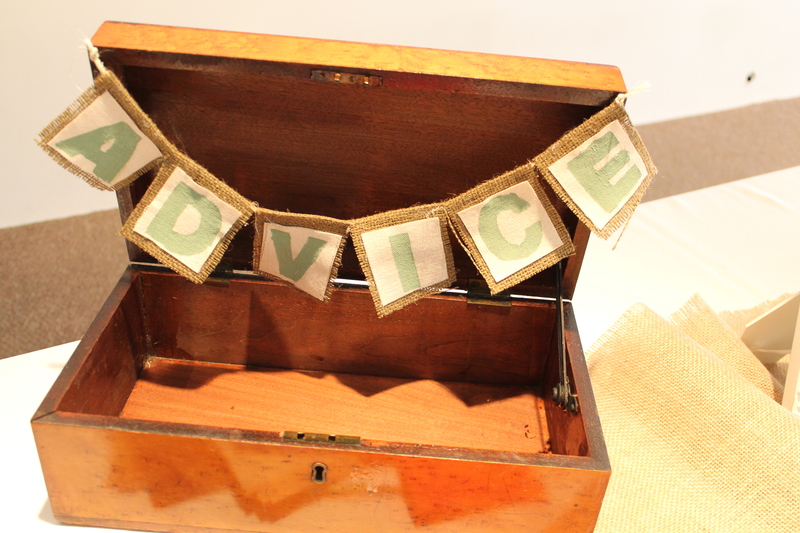 It worked perfectly for collecting advice cards written by family and friends. 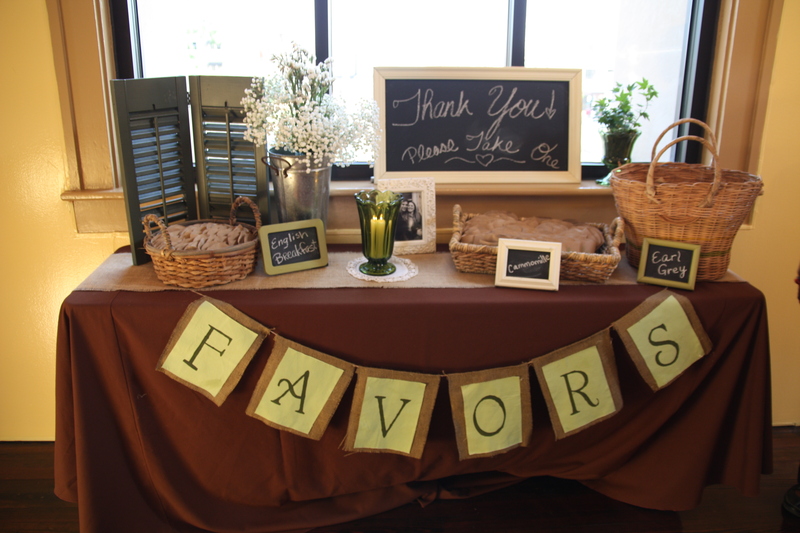 The sign is made from burlap, canvas fabric, and paint strung together with twine. We left out cardstock and sharpies for people to write their advice for us. 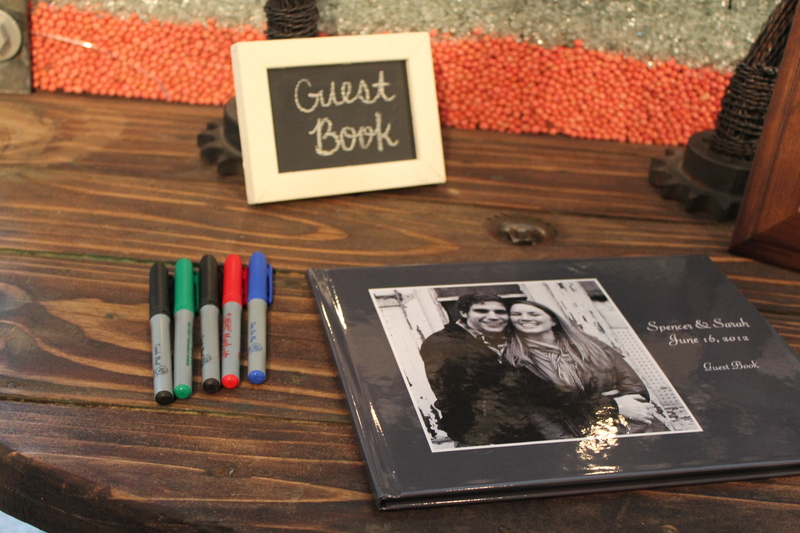 The guest book was a shutterfly book we made filled with pictures from relationship. We love being able to look through it because of the pictures and the notes! 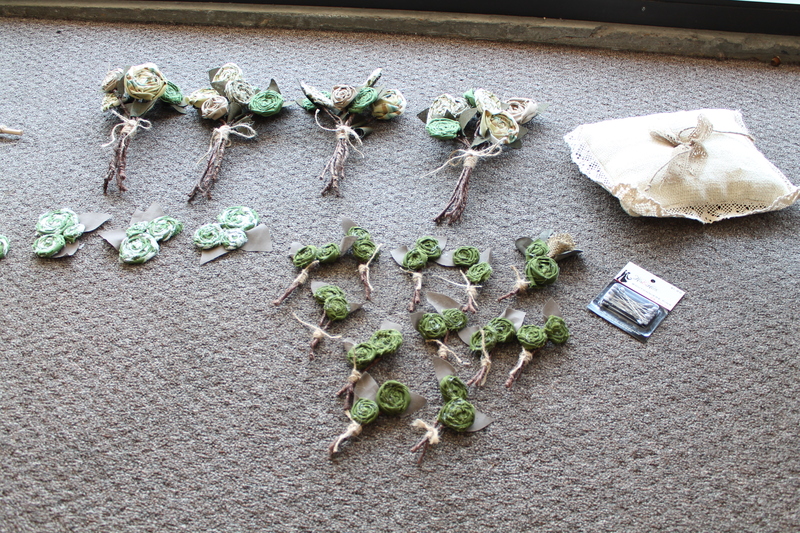 I had this crazy idea of making the bouquets and boutonnieres. I loved the idea of everyone being able to keep theirs, and so that’s what we did. A friend taught me how to make them and helped me. After hours of making fabric flowers, I think they turned out wonderfully! 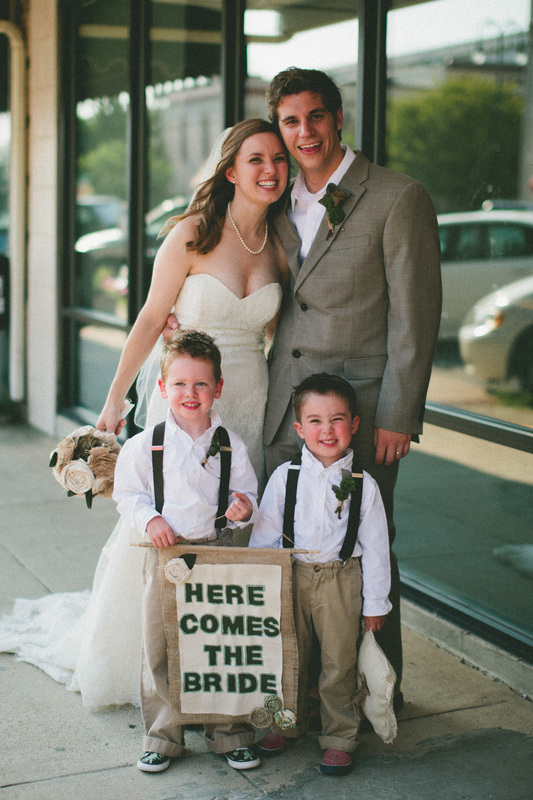 These handsome little guys held a sign and pillow that were made also. I made the sign and my mom sewed the pillow. 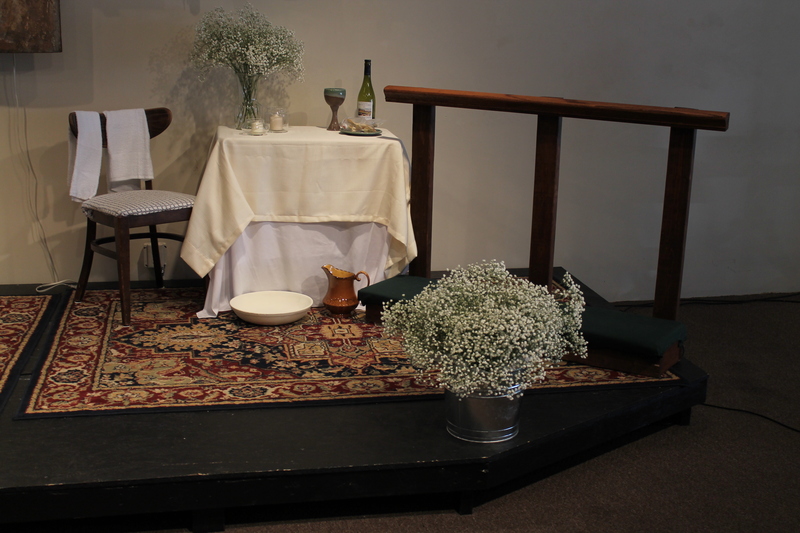 The prayer bench Spencer made as a wedding gift. 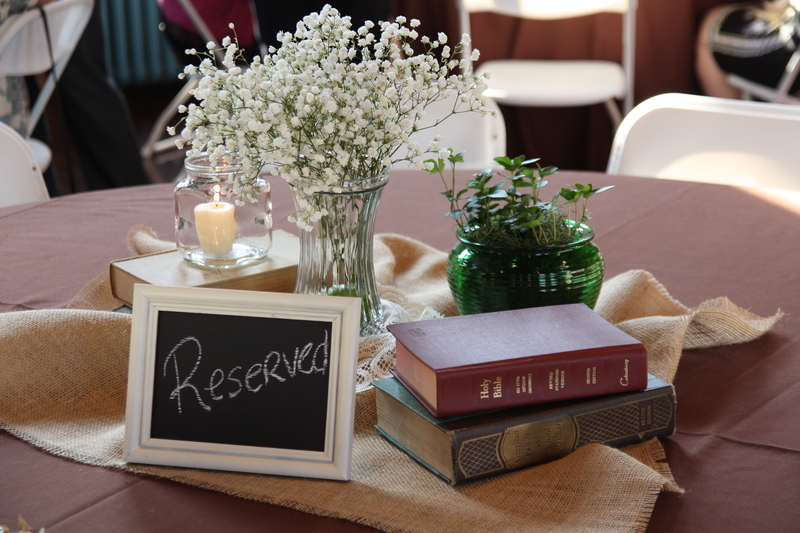 We used it in our ceremony when we prayed together and took communion. And now it is a treasured piece in our home. 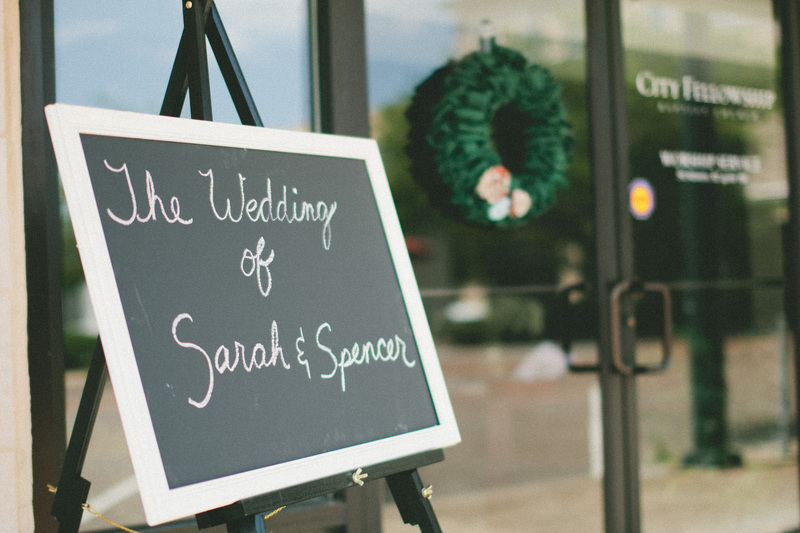 The sign hanging on the wall had our wedding date on it and was the perfect, simple backdrop for chalkboard message pictures guests could have taken. We took this photo and used it on postcards we sent out to our wedding guests to thank them for coming and celebrating with us. 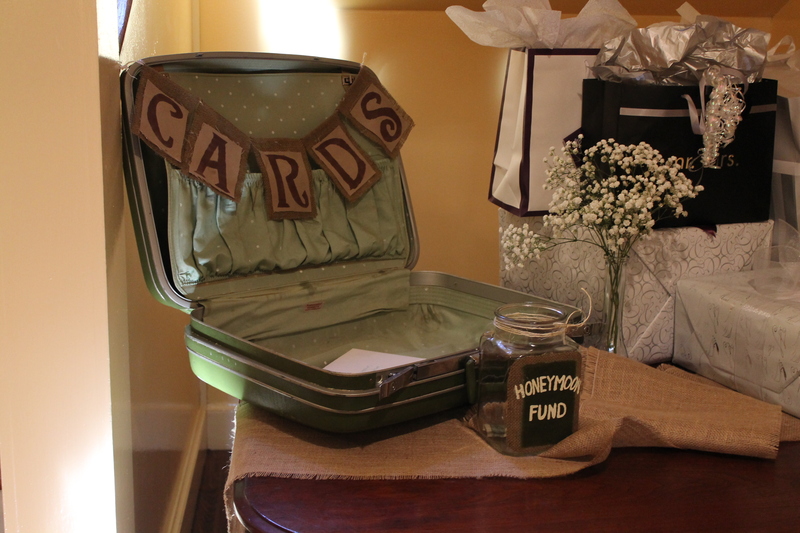 At the reception we had a gift table set up with an old suitcase for cards and a jar that said “Honeymoon Fund” for any cash. 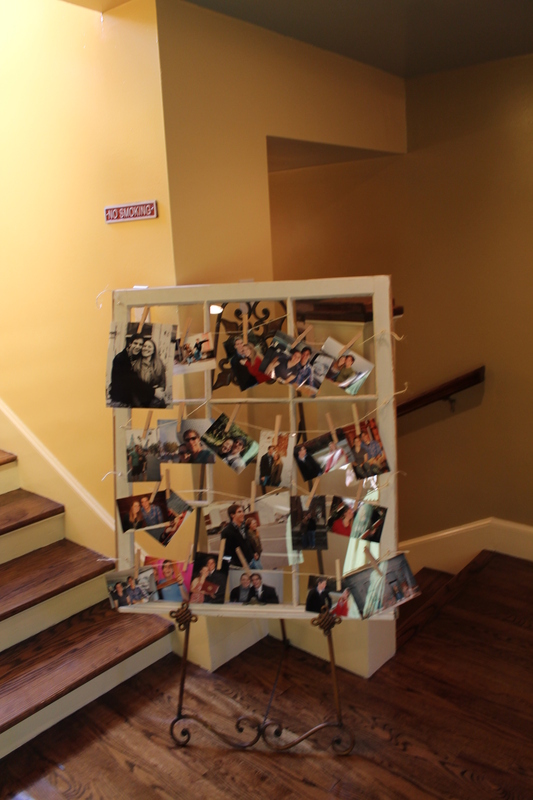 An old window was the perfect way to display pictures from our relationship. 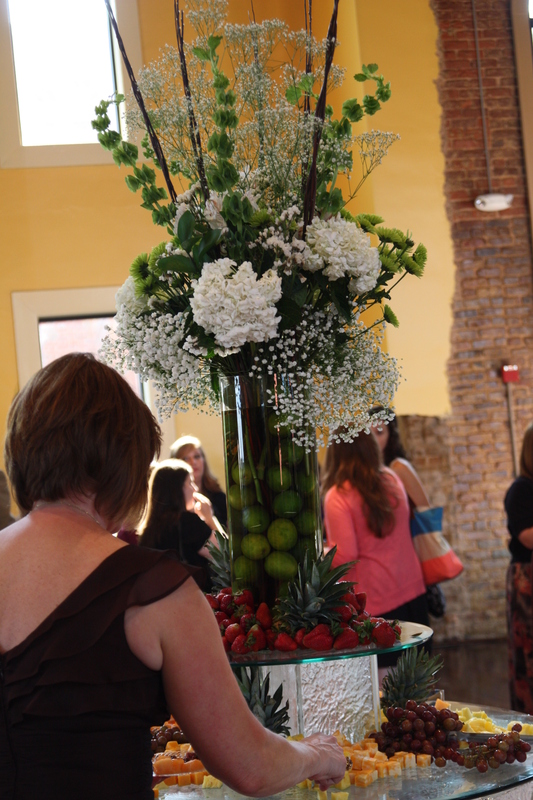 No need to pay loads of money for a florist when plenty of talented family and friends are around. My mom borrowed this vase from one of her neighbors and my aunts put together this beautiful floral arrangement. 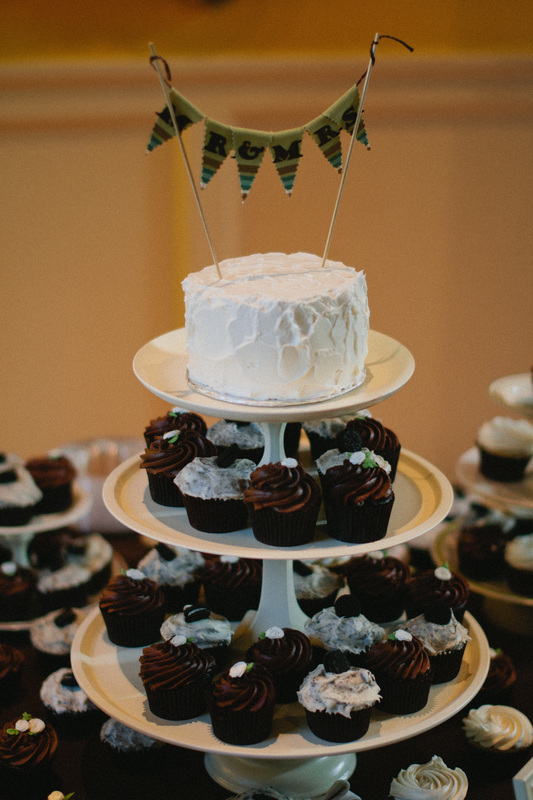 We had a small cake to cut and then provided guests with lots of wonderful cupcakes. 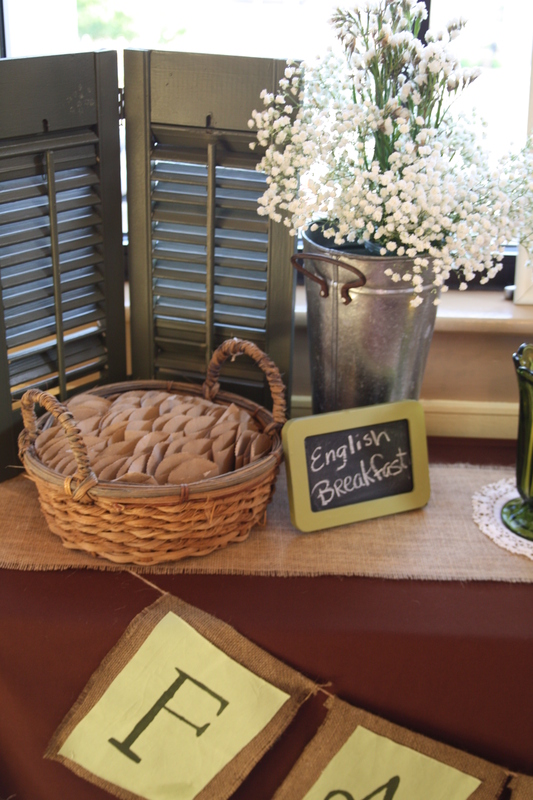 And as a groom’s cake, we had a table full of chocolate chip cookies (Spencer’s favorite dessert)! They were all a hit. 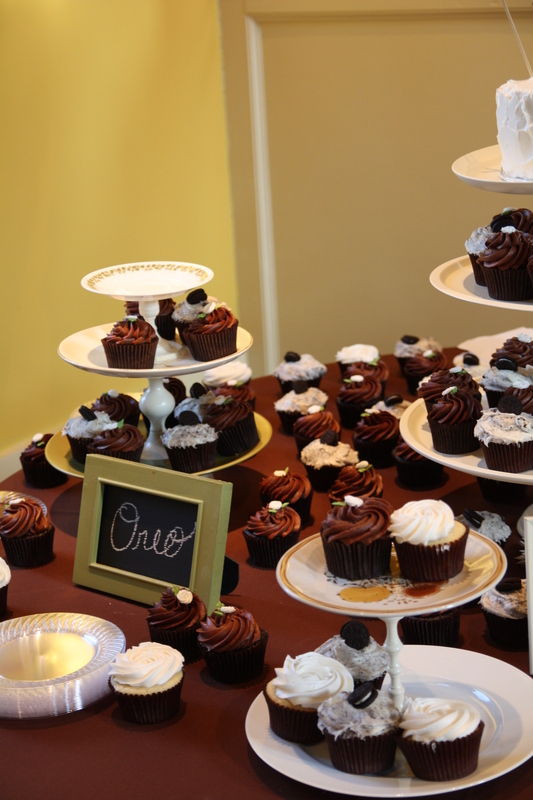 The cupcakes stands we made with plates and candlestick holders. 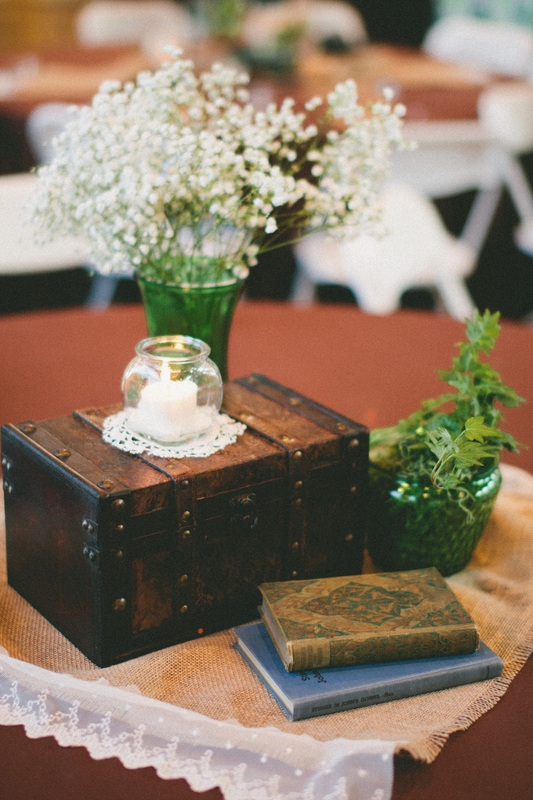 My mom did such an incredible job helping with so many things for the wedding. 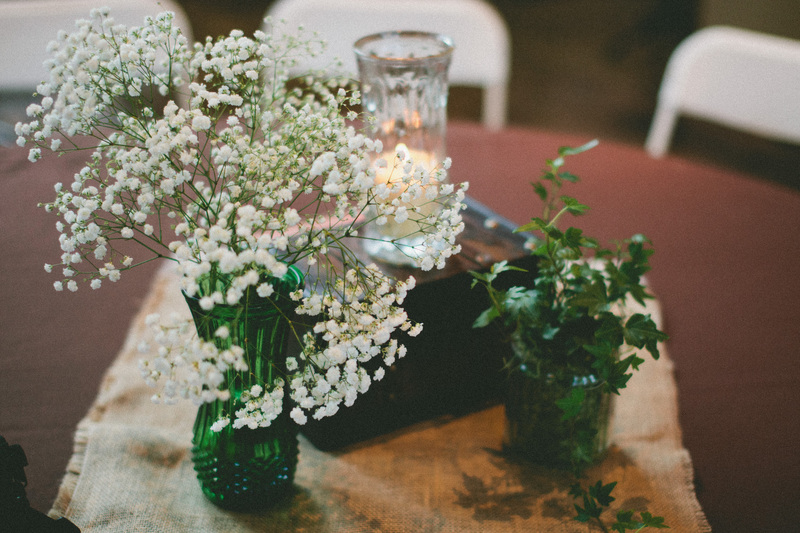 She set up the table centerpieces at the reception using candles, old books, greenery, burlap and lace, and mixtures of green and clear glass vases. Each table was different and they were all perfect. Our favors were different types of teas. We found little brown bags at Hobby Lobby and put a tea bag in each one. We stamped the bags with Psalm 37:4 on one side and the stamp we used on the programs on the other. 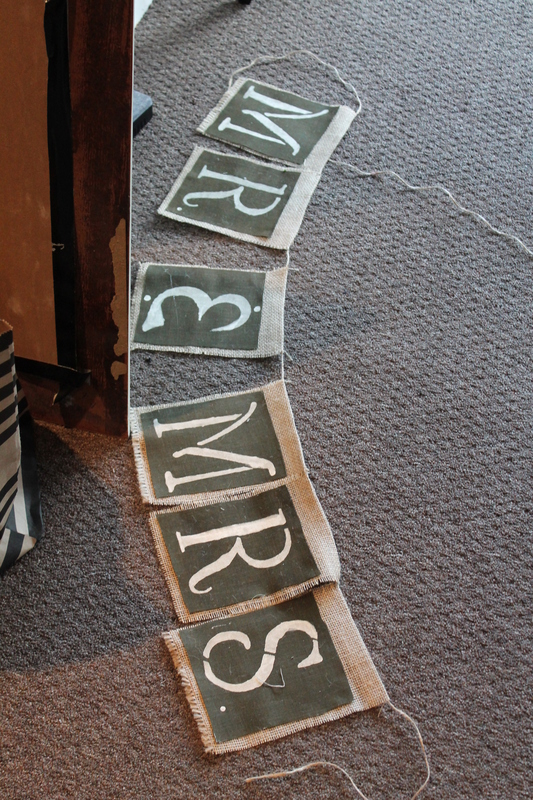 So that’s a little look into our wedding decorations. 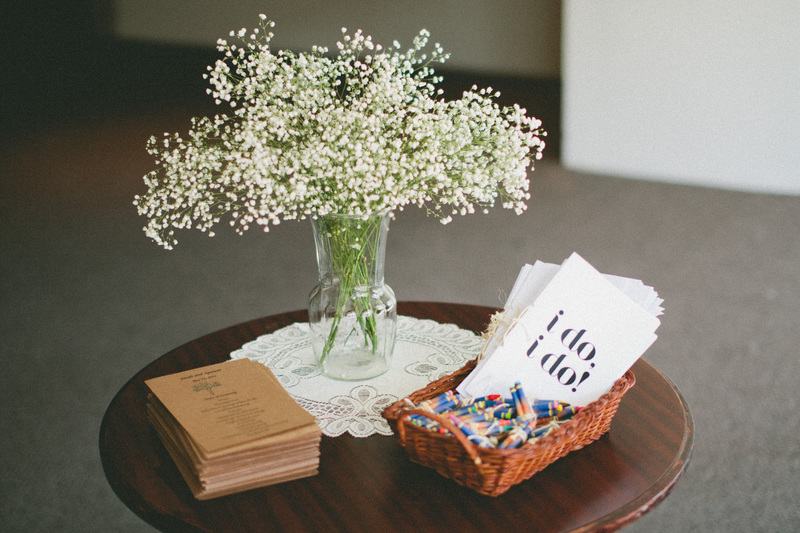 Hope it helps your creativity as you plan for your special day!